Rolclub does not endorse ads. Please see our disclaimer. Above banners and links are advertisements only. We do not endorse or vouch for any advertisers. Put Your Banner Here NOW! Get members to vote for your program on Rolclub by displaying our "Rate Us" buttons on your main page. To rate this program, please log in or register. Welcome to Hour Cryto LTD The trustworthy Cryptocurrency investment portal to fulfill your financial dreams & aspirations. 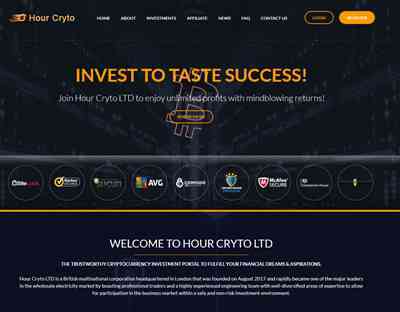 Hour Cryto LTD is a British multinational corporation headquartered in London that was founded on August 2017 and rapidly became one of the major leaders in the wholesale electricity market by boasting professional traders and a highly experienced engineering team with well-diversified areas of expertise to allow for participation in the business market within a safe and non-risk investment environment. 800% after 3 days + Principal Back (only available for 40 investor. Available : 35 Unit. Sold : 5 Unit). Join Now ! 1000% after 7 days+ Principal Back (only available for 50 investor. Available : 42 Unit. Sold : 8 Unit) . Join Now! 14.04.18 08:02 Transfer Sent Payment: 50.00 USD to account U15337587 from U1294xxx. Batch: ‎211520857. Memo: Shopping Cart Payment. Deposit to Hour Cryto LTD User allhyips. 15.04.18 09:59;Account;Receive;Received Payment 24.75 USD from account U15337587 to account U1294000. Batch: 211601796. Memo: API Payment. Withdraw to allhyips from Hour Cryto LTD.
16.04.18 09:52;Account;Receive;Received Payment 1.2 USD from account U15337587 to account U1294000. Batch: 211686681. Memo: API Payment. Withdraw to allhyips from Hour Cryto LTD.
16.04.18 20:13;Account;Receive;Received Payment 3.7 USD from account U15337587 to account U1294000. Batch: 211742830. Memo: API Payment. Withdraw to allhyips from Hour Cryto LTD.
17.04.18 08:32;Account;Receive;Received Payment 2.2 USD from account U15337587 to account U1294000. Batch: 211778628. Memo: API Payment. Withdraw to allhyips from Hour Cryto LTD.
$10.00 has been successfully sent to your AdvCash account [email protected]. $0.26 has been successfully sent to your Payeer account P88839824. 18.04.18 08:50;Account;Receive;Received Payment 21.85 USD from account U15337587 to account U1294000. Batch: 211883236. Memo: API Payment. Withdraw to allhyips from Hour Cryto LTD.
17.04.18 20:00;Account;Receive;Received Payment 19.35 USD from account U15337587 to account U1294000. Batch: 211843106. Memo: API Payment. Withdraw to allhyips from Hour Cryto LTD.
$0.22 has been successfully sent to your Payeer account P88839824. 19.04.18 11:51;Account;Receive;Received Payment 2.2 USD from account U15337587 to account U1294000. Batch: 211993432. Memo: API Payment. Withdraw to allhyips from Hour Cryto LTD. Earn Upto 20% From ROLCLUB's Ads Sales By Referring Clients. E-Currency Info - Perfect Money, Solidtrustpay, AlertPay, Hd-Money, Payza , WMZ etc. A Happy Birthday to YOU...!!! - Over 20.000 UNIQUE Daily! - Get Maximum Exposure For Your Site! - Get QUALITY Converting Traffic! Out Of Billions Of Website's Online. Page generated in 0.2294 seconds with 14 queries.